- Full night lost to humidity and clouds. t to us around 1 AM. Enveloped by ridge cloud before midnight. No observations tonightdue to thick cloud, lightning and high humidity. Rained most of the night - did not open. - Heavy rain the whole day and most of the night. Did not open. not open due to the bad weather. 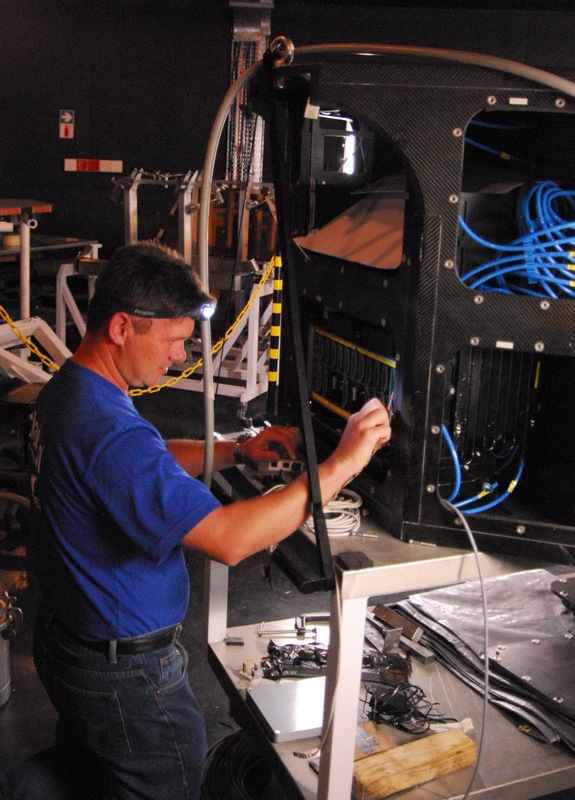 Spend some time on the RSS tests. some time outside to enjoy the Geminids. humidity. Ridge cloud just before midnight. - Did some of the RSS tests. Bad seeing and thickening clouds precluded any really useful on-sky work. 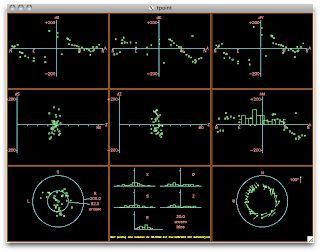 Did make progress on defining relative positions of camera. BCAM FLI focuser mechanism tried out. Others: Simon, Martin initially, then Peter and Charl. how) run the FLI focuser, independent of tel. focus. Current focus offset between the two cameras is ~1.5mm. overheating of anti-gravity motor, which was in excess of 30 deg. success for some reason TBD. 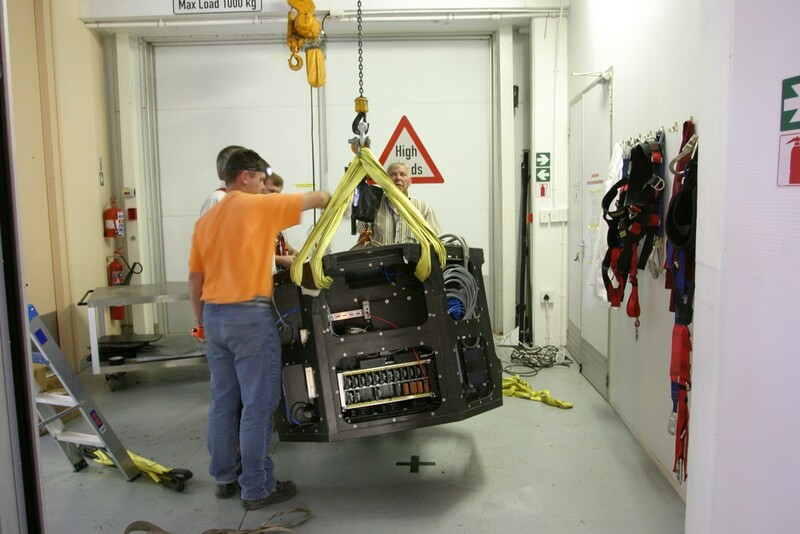 Some RSS grating flexure tests done during tracker fix. 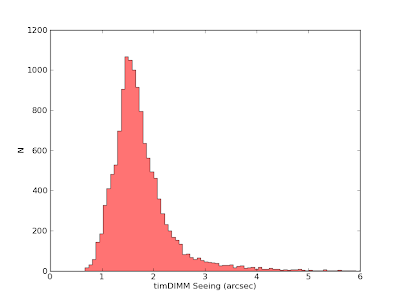 burst mirror for Darragh and then high-seeing pointing data for Tim. taken for IQ and pointing tests. the seeing is approximately 1 arcsec. Closed for work on the apogee camera. Closed due to work on the tracker. We tried out some burst mirror tests for the IQ. 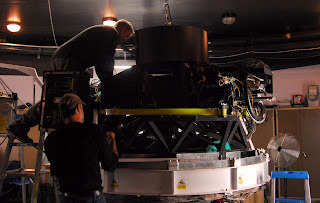 Others: David B., Martin, Charl, Peter, Patrick, Michelle, David E.
around with some imaging tests with Tracker Rho, but did not see any changes. 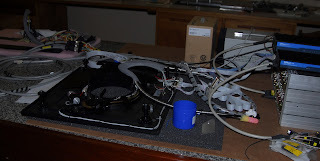 => No observations tonight due to work on the payload. What's been happening up at SALT?! I'm ashamed to admit that I haven't taken any recent photos of the SALTICAM work, despite the fact that some very cool things have been happening - apologies to the devoted optics groupies out there! In addition to all the other upgrades to the instrument, the integration of the autoguider required that the relevant lenses be transferred to a new rear barrel which will accommodate the additional hardware. In testing the optics again afterwards (with the interferometer used for the SAC work,) some problems became apparent & Darragh found himself nursing a sequel to the SAC IQ drama. 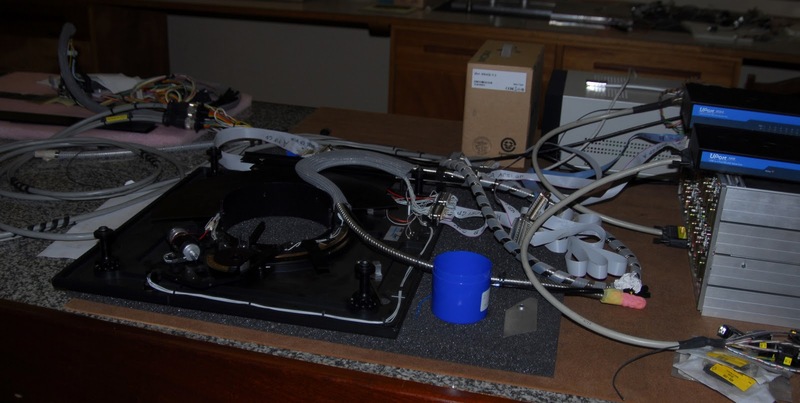 Fortunately, with his black belt in Zemax & the help of Craig, Tim & Francois, SCAM's IQ problems proved no match for the instrument PI & the system was soon whipped into good alignment & the autoguider could be installed. 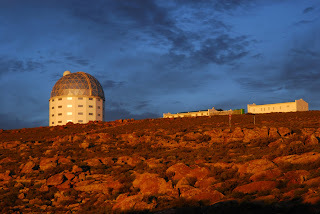 As for the action in Sutherland - a great deal of work's gone into every sub-system, including re-wiring the entire tracker, eliminating sources of heat within the telescope enclosure, improving the primary mirror alignment process, getting the payload re-organised &, of course, (all the king's horses & all the king's men) putting RSS back together again. 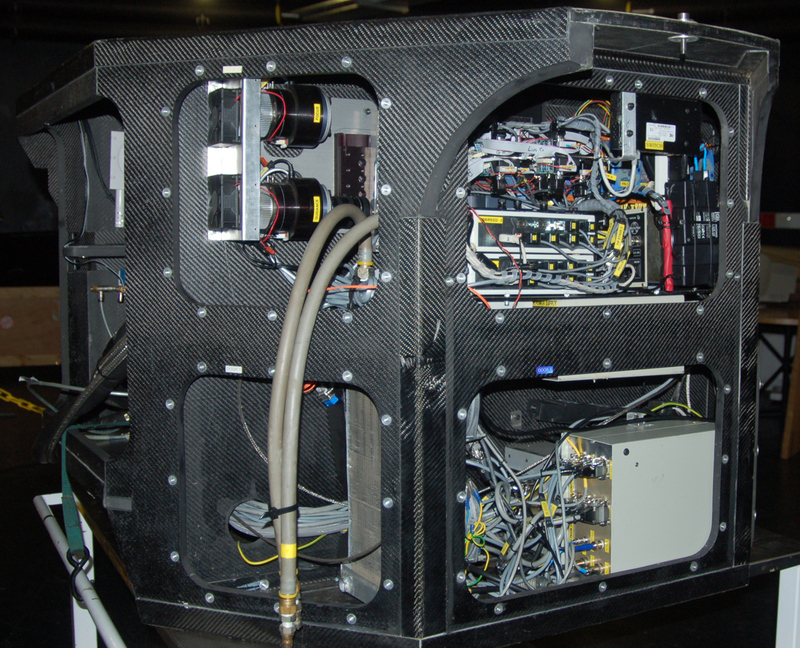 The payload was always a bit of a nightmare - here's an old pic of what it used to look like. 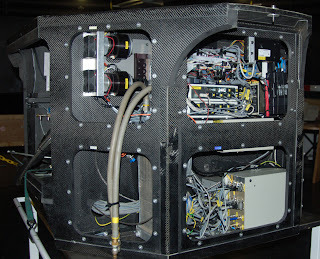 A nifty new electronics rack now takes care of all the major systems within the payload & will simplify life enormously for everyone concerned. The finishing touches were being applied early last week. 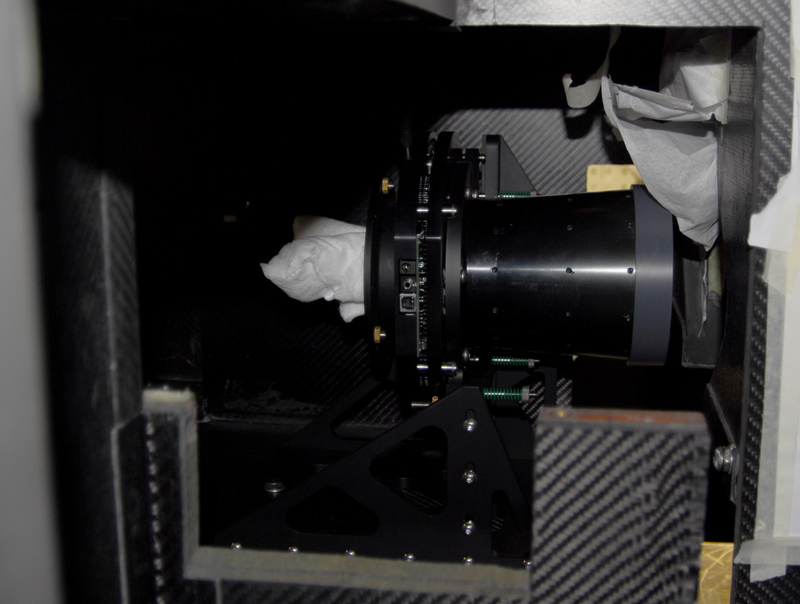 Another addition to the payload is B-Cam, a backup acquisition camera. 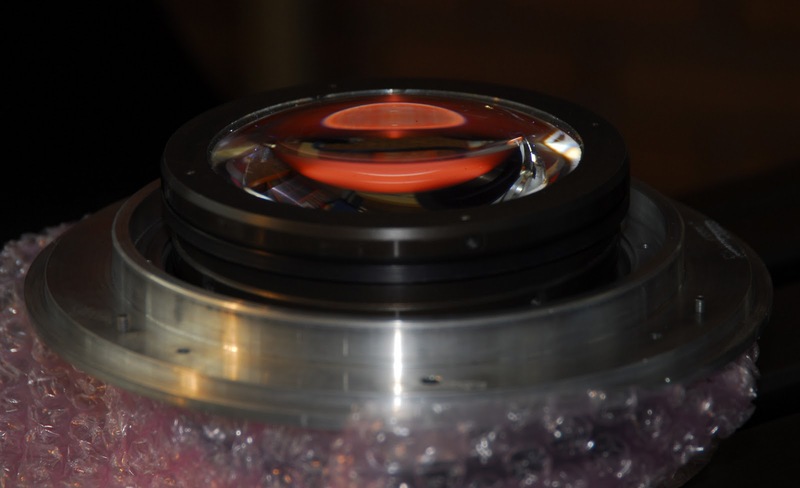 The optics had been in hand for a while already, but the rest of the instrument could only be designed & manufactured post-IQ. 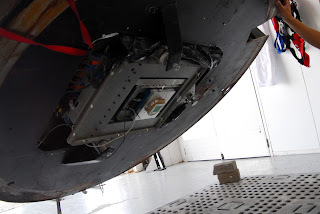 The new hardware was aligned last week & the Apogee CCD used for the IQ on-sky testing will be the detector. In the RSS department: the instrument's really looking like a spectrograph again & Peter's thumb seems to be making an impressive recovery too :) Before returning home from the SALT Board meeting, Ted spent some time checking out the Fabry-Perot side of things (the high resolution etalon's been repaired & is happy again). 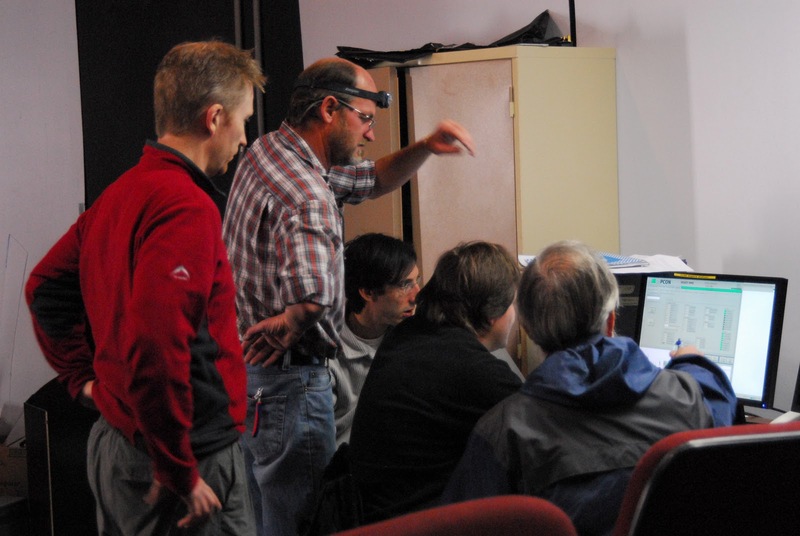 Then the Wisconsin team (Ken, Mike & Bill) established camp in the spectrometer room for a couple of weeks & worked through an extensive to-do list with Peter, Anthony & the rest of the gang. 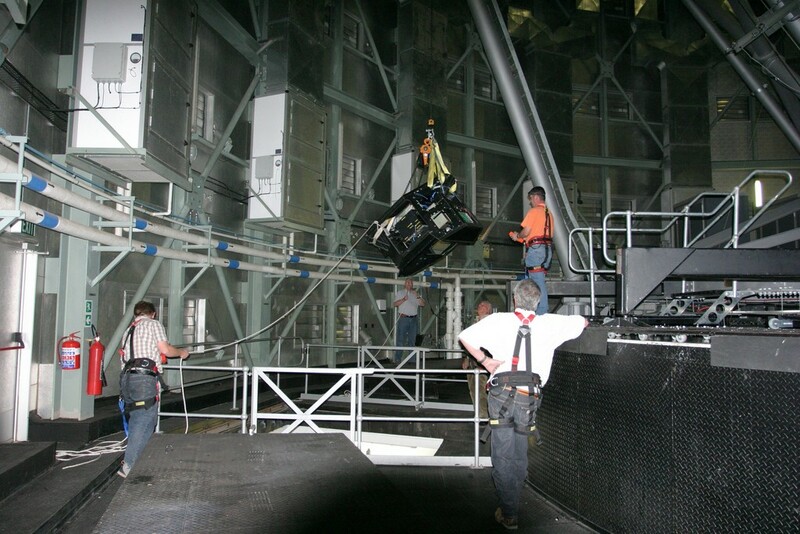 Successful hardware interventions included extracting the air bubble in the collimator's lens fluid, sorting out mechanical clearance issues with the wave-plates, adjusting the alignment of the detector, fixing the sag in the camera articulation mechanism & baffling up as much of the camera system as possible. 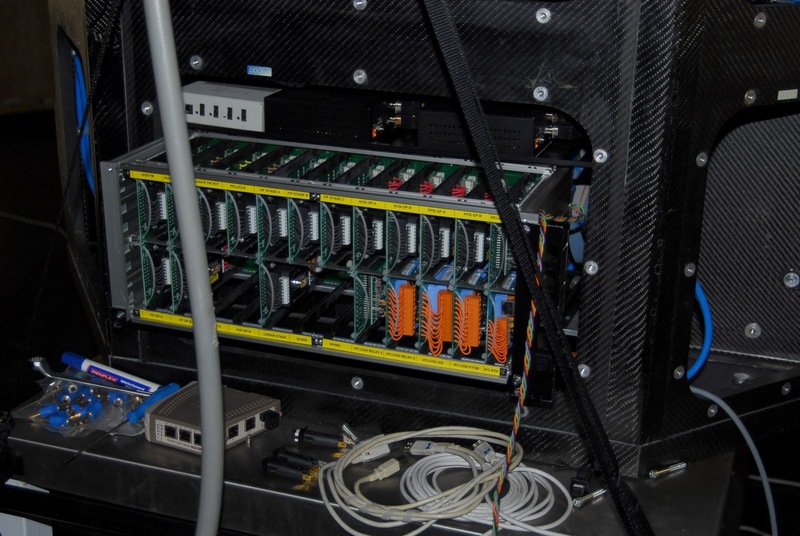 A lot of progress was made on the software side as well, such as the development of auto-focus routines, the introduction of various checks to monitor & report on the status of different mechanisms & also to control the gratings, filters, wave-plates etc. 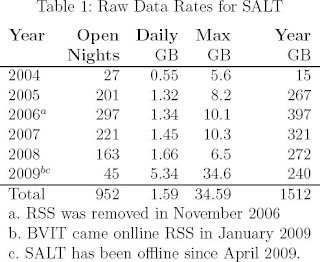 The overall level of user-friendliness has increased enormously since those dark early days of SALT spectroscopy! 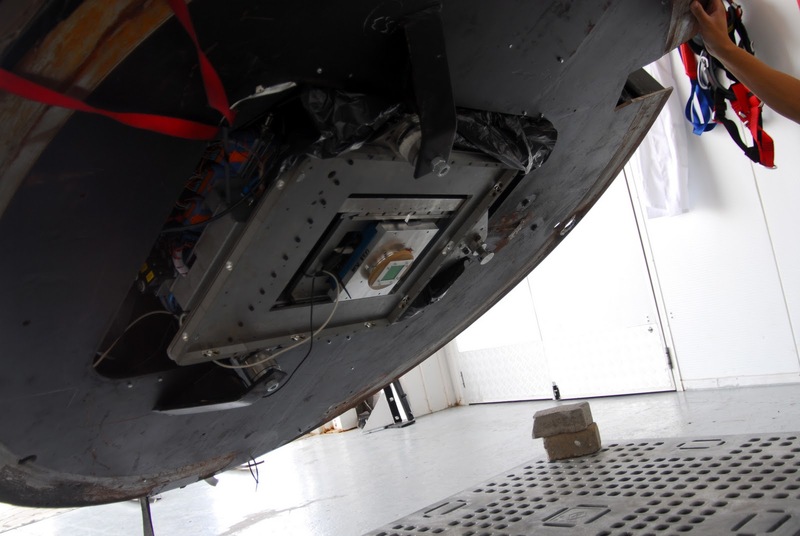 Meanwhile, upstairs, the assembly holding the Apogee camera in place had to be removed from the payload so that the guys can access the Rho stage to go about fixing its wobble. & came in for a gentle landing down in the loading bay. Then on Friday morning, the payload was rigged up & cleared for take-off. Thanks to Janus for providing us with photos! Jeremy Clarkson might ask: "How hard can it be?!" => No IQ observations tonight because strong wind and bad seeing. Others: Chris, Ardhisha, Jonathan and Don Pinnock for Getaway magazine. => No observations tonight because weather. but there were problems with Dummy PFIS later. Sharl and Jonathan were need to exchange some cables. Finally this problem also was solved. 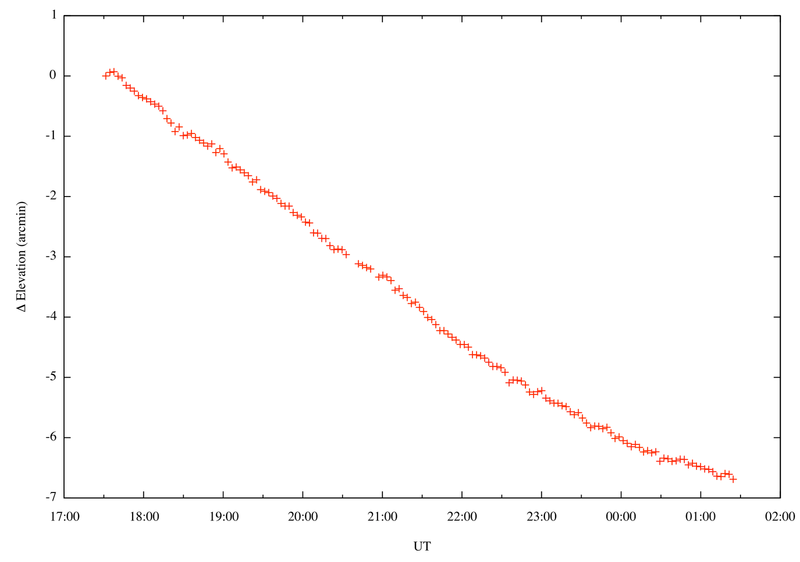 => Apogee camera is still off tonight. No observations for this reason. - Apogee camera is off tonight, but its no loss since the weather is bad. seeing conditions no data was taken tonight. 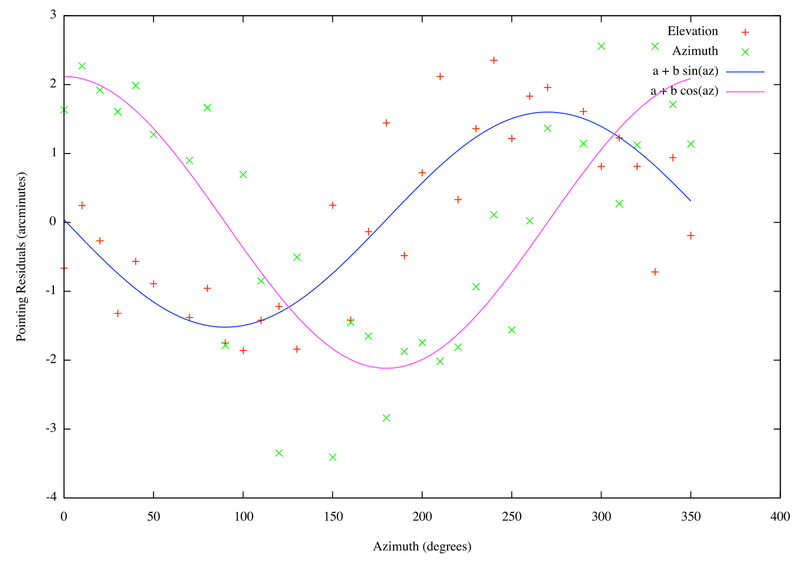 the terms IA and IE are basically encoder offsets while AN and AW are misalignments of the azimuth axis in the north-south and east-west directions, respectively. these numbers agree qualitatively with what i found with the salticam data in the sense that there's a significant axial misalignment of the order of 5-6 arcminutes. 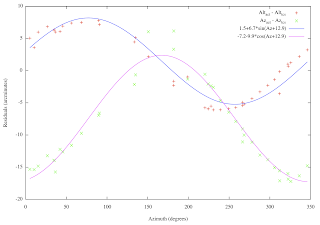 the measured amplitudes of AN and AW don't quite agree within the errors. also, the tpoint residual plots show some systematic errors in the residuals that are not being modeled (probably to do with the phase offset i found in my sin/cos fits). the upshot is that i need more data. so if the seeing is not good enough to do IQ tasks, please take more pointing data for me. the more, the better. the procedure is pretty easy. pick catalog stars with good coordinates that have tracks as centered as possible. then tweak the telescope's pointing to place the star as close as possible to the position of the center of rotation. 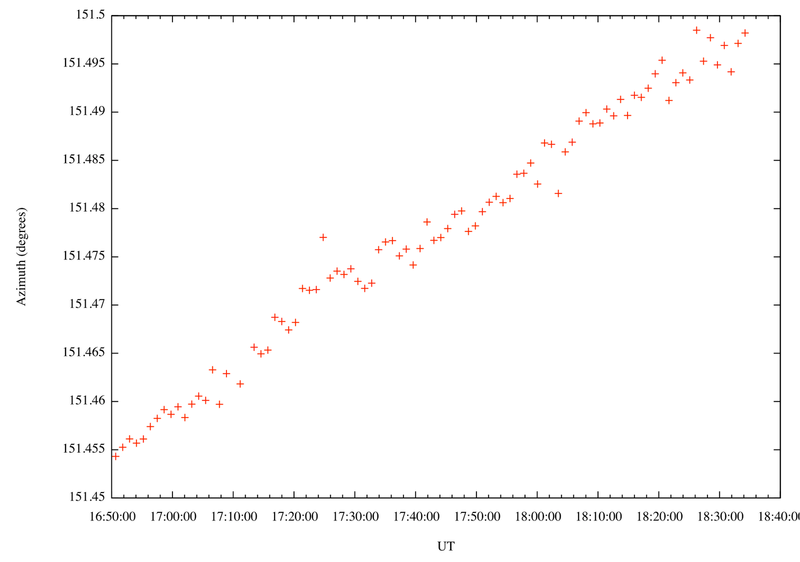 i believe petri determined this and it should be in the logs somewhere (near X=223, Y=273). once the star is there, take image and save the data. also remark in the log which images were used for pointing. seeing and focus can be bad. i only care that the star gets centered onto the center of rotation. - Tonight was plagued by bad and variable seeing. - Seeing at the beginning of the evening was good according to timDIMM (<1''). clouds flying over during the whole night, which made matters more difficult. - Strong wind, high humidity and clouds. Did not open. tomorrow evening, but a little more constant. - Cloudy and humid, did not open. positions this time. See notes. pointing down. See notes for more. - Finished the pointing model observations started last night. - Beautiful night, but poor seeing. better than ~1.6" stars. Saved one sequence. - Did a bunch of pointing model observations. - Humid, did not open. - Heavy clouds and humid, did not open. the alignment and were need for more help. to make some IQ tests. A lot of thanks to Ardhisha, Martin, Eben, Jonathan and Sharl for their help! => Some IQ observations tonight. how IQ depends on it. => Some IQ observations during 2/3 of the night. the first half of the night. => Some IQ observations during first half of the night. Seeing was around 1.8". After that humidity raised fast. 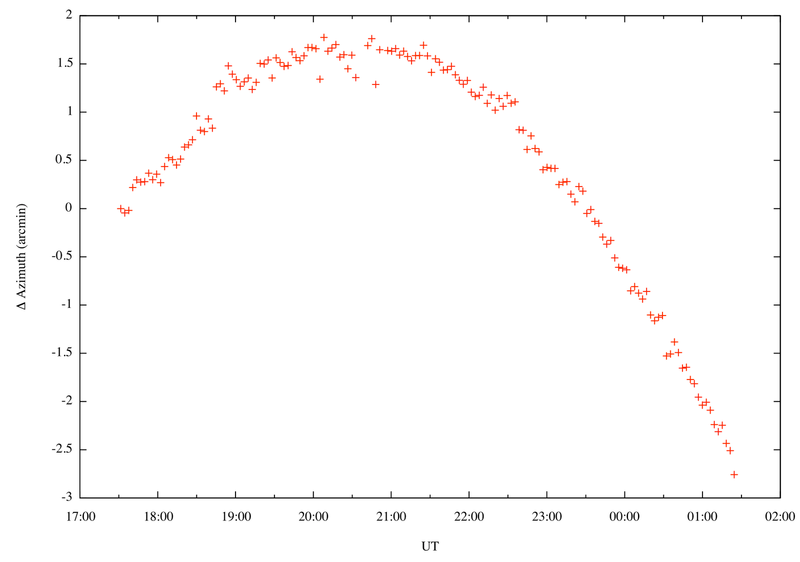 => Some IQ observations during first half of the night with clouds around. Seeing was around 1.8", but variable. => High humidity and clouds - did not open up. the night, but we lost the race. High humidity all night.
. High humidity all night - never opened. where is all of the IQ data?
. Cloudy and high-humidity. No data tonight. prevented us from getting a decent set.
. High humidity and high winds - did not open up. SALT is currently off-line to carry out some engineering work to the rho stage among other things. Night-time work will resume on 21 October. towards the end of the night but not enough to open. didn't get much done tonight except for testing some software. the humidity shot up dramatically. That means no data for tonight. - Clouded out, did not open. visible, so work to chase remaining smaller issues continues. 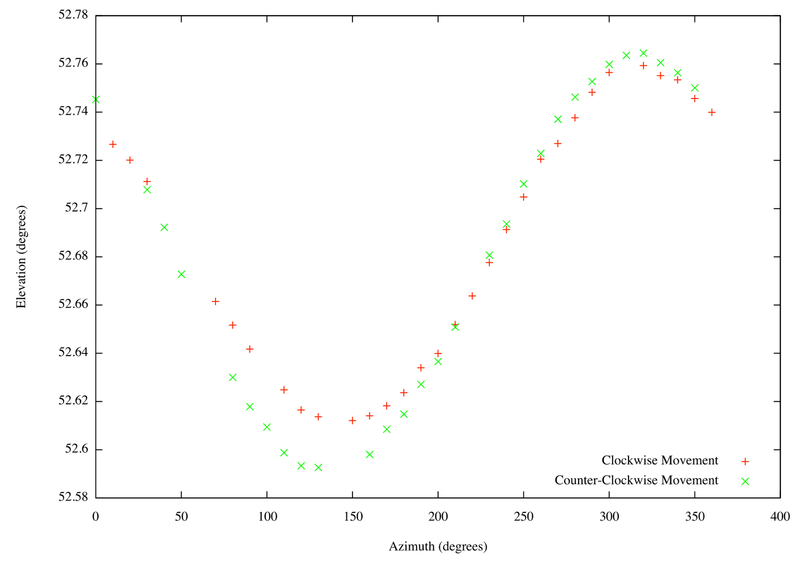 field, and stable auto/collimator performance. - Night cut short with clouds. See Lisa's post on SALT IQ blog (I've even stolen the her post name) for all the details and lots of beautiful pictures. 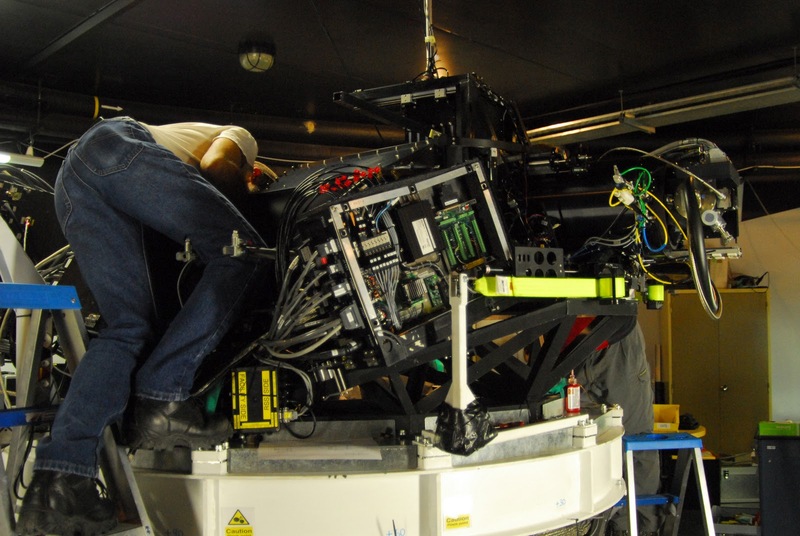 There is still plenty of work to do before Darragh and the IQ team start on-sky testing, but this is huge step forward in returning SALT back to full operations. Congratulations go out to Darragh, the IQ team, and the SALT operations team! 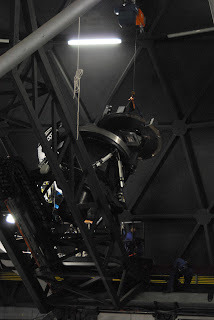 since weather cut us a bit short on the previous try, i redid the test of leaving the telescope open, but parked in a fixed position while taking images of the sky to measure the actual pointing position. 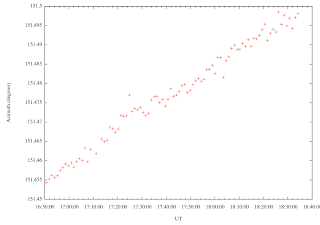 this time we pointed SALT to an azimuth of 180, locked the tracker at (0,0), and took data for about 8 hours. 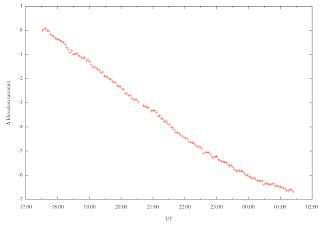 the air temperature was not changing quickly during this time, though the wind did kick up considerably after about midnight UT. 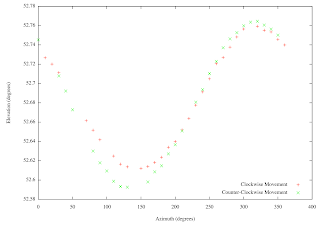 the behavior in elevation is similar to the previous test. 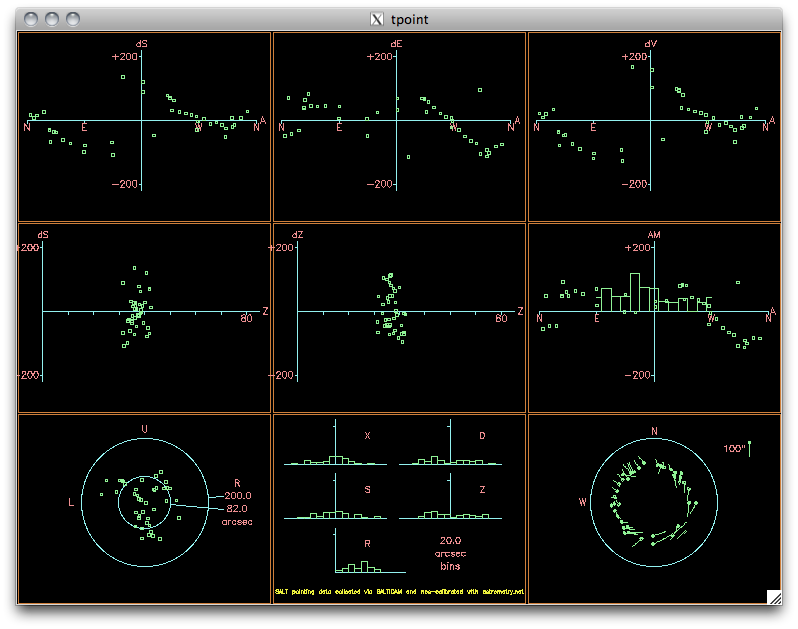 the azimuth behavior, however, is rather surprising and i'm not sure what to make of it. what is clear is that there are significant drifts in pointing that occur without anything happening mechanically with the telescope. i suspect they're related to temperature changes and/or radiational cooling. i also suspect that they'll be difficult to model and predict accurately. ted worked on FP stuff most of the day and through the evening until about 2300. tim assisted in the afternoon and evening. details to follow in separate note. 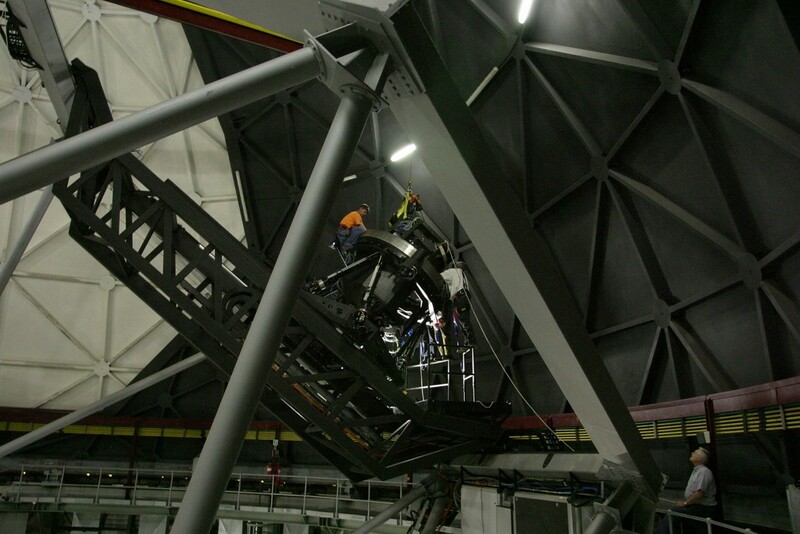 jonathan and hitesh performed a mirror align test and then tim opened up, pointed at az=180, and let the starcam take images every 3 minutes from 1930 until 0325. analysis and results to follow later. 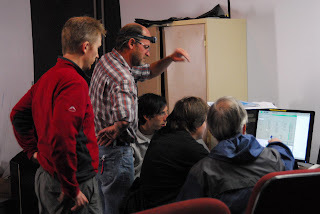 tim also ran the seeing monitors (mass-dimm + timDIMM) from 0000 until 0315 when high winds kicked up and started blowing scopes around too much. no SALT operations other than hitesh doing a quick mirror alignment to test something. tim and ted worked on FP stuff until 2330 and then tim worked on mass-dimm/timdimm stuff until 0330.
ted worked on FP stuff most of the day and through the evening. tim assisted in the afternoon and evening. charl gave a tour to the group from university of central lancashire and exercised the structure as part of the exercise. with an assist from hitesh tim opened up and did some starcam observations with the structure and tracker both fixed in position. got just under two hours of data before being forced to close due to humidity at 2040 SAST. 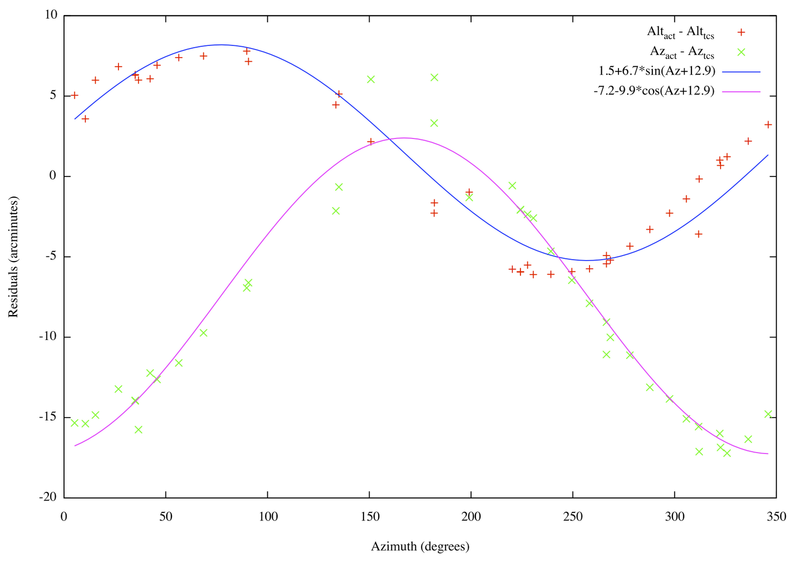 the behavior of the previous starcam results led me to believe that the non-repeatability probably has something to do with temperature effects. 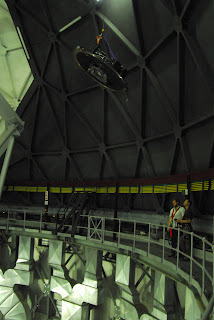 namely, the clear, dry conditions we were experiencing means the sky is very cold and different parts of the structure will couple to that differently depending on how they're shielded by the dome. to test this, we took some data tonight with the structure fixed at an azimuth of 150 degrees and the tracker locked down at (0,0). 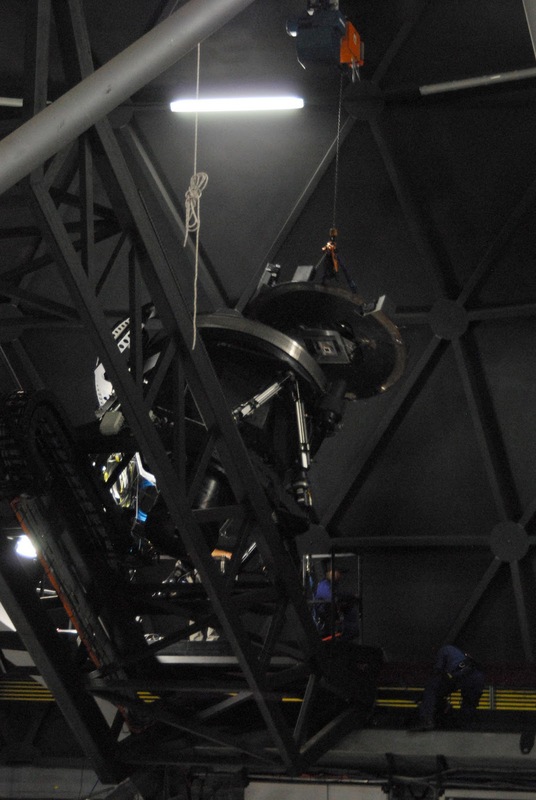 in this configuration with the dome open we ran a script to take a starcam image once a minute. we were only able to get just shy of 2 hours of data due to high humidity, but even this was enough to show significant drifts in both elevation and azimuth (see attached plots). the drifts amount to 1.1' in elevation and 2.7' in azimuth. we didn't open the louvers or condition the chamber well so this probably exaggerates the effects of temperature variations, but it does show how significant they can be and the results are consistent with what we observed in our previous tests. 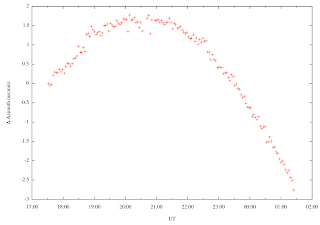 *Took more StarCam data to characterize polar misalignment. This went mostly smoothly, with two structure position losses. *Winds were too high to take SAMS data. work and best of luck. 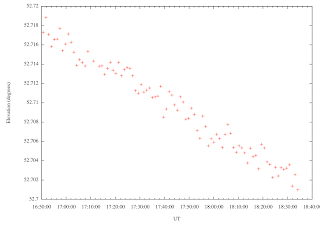 We took more pointing data later on during the night of 20100720, but this time in a more careful manner. We performed large moves back to Az = 0 several times during the course of taking the previous data which we think probably created the large amount of scatter. 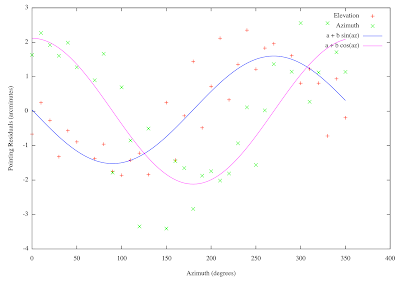 This data was taken by making small 10 degree moves in Azimuth in the same direction between each observation. We took one set moving in a clockwise direction from Az=0 and another set moving counter-clockwise from Az=360. As we hoped, taking data in this way shows the systematic cyclical signature much more clearly. Recall that for our experiment the elevation is fixed by leaving the tracker locked at (0,0) and thus should remain constant. plot is posted on the blog that shows the results from last night. got alot of good data! environmental conditions change). Hitesh took SAMS data later. lost encoder counts and thus did not know its location. * Did not open up tonight because of the weather. SAMS tests all night. During the day we had dew point warning on SOMMI which was clearly wrong. nicely equalized and temp gradients are flat as a pancake. due to low levels of glycol. Opening louvers early instead. 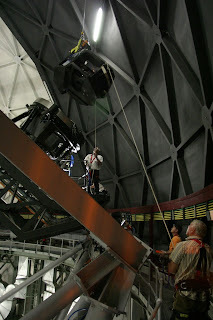 * Video feed from star tracker is working!! Thanks Charl and Hitesh! intended for the computer room and installed in the control room. * External dewpoint alarm triggered when T-ext=10? hardly going to affect our IQ anyway!). and reamains ready. It won't move though, so it should be a fault. * Had one fatal following error on tracker that aborted our track. OK on repoint. Charl, temp on the rho motor was OK.
1. We continue our checks of alignment and its degradation. Segment 65 is out of the loop. We worked only with Side1 tonight just to see how the method works. Side1+Side2 alignment degradation have to be checked during next weeks. I loged rms of Side1 altogether with temperature and humidity at 2m. of the degradation are take it into account somehow. 2. Teaching of new SOs was continued during the day and the night. 1. We continue our checks of alignment. 2. Teaching of new SOs was continued during the night. 1. SPS error was generally fixed by Hitesh and Deon during day time. Segments 3 and 41 were disconnected. 2. Two new SOs arrived today and Fred started teaching. have to be studied tomorrow by Hitesh and Deon. upper left and right). No major problems. taking a short track (aborted). ended 10 sec. before timeline said it should. we can do CCAS/MACS tests. No any major problems were detected. calculation of time for each. See log for details. 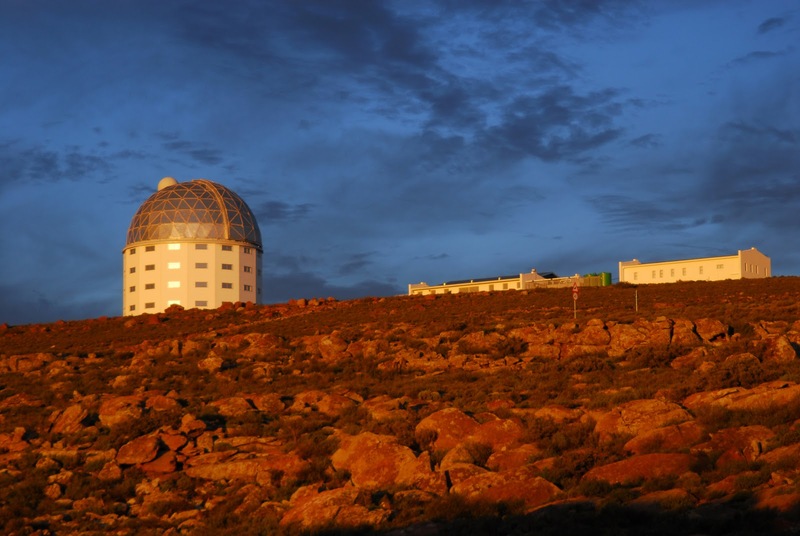 Welcome to the SALT Astronomy Blog! By popular demand, we have launched this blog as a public interface to what's going on at SALT. It will initially be devoted to posts about the progress of SALT's recommissioning. 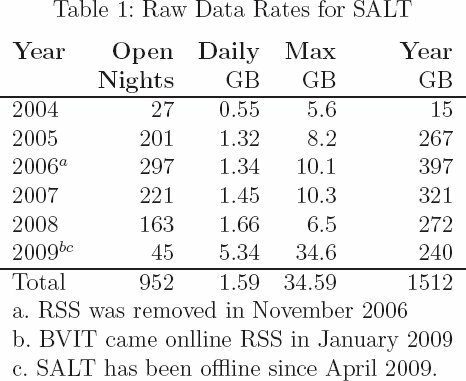 Eventually it is expected to become a general SALT blog with occasional posts about specific items or events and regular automated posts generated by the SALT Astronomer logging system. and tracker+structure+dome (but without shutter) after that. 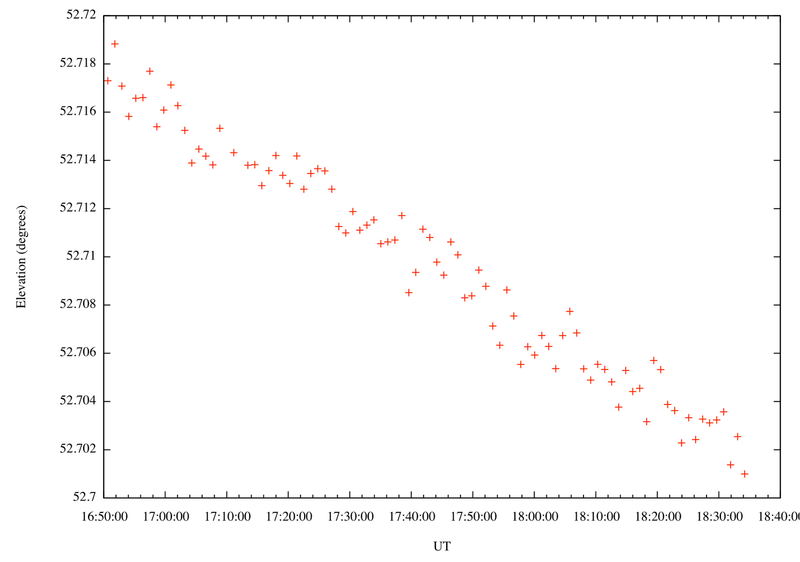 selected using OPTI, sent to TCS and telescope started after that. proper motions in the different way compare to TCS. 4. ELS display does not show RA and DEC. TESTING. The second "night" of the new SALT season. Bit of shutter work during the afternoon. - Cable wrap at N structure movements. - a few temp measures, see log 20106002. 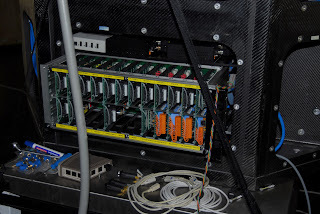 - Dome shutter should be ok, but keep monitoring. structure movement other than extreme N.
Tracker will be tested next week. TESTING. The first "night" of the new SALT season. ok otherwise, but cable wrap problem every time at North. open/close, but system does not know it's open. will open only to 20% in 'automatic'. Deon to check next week. when in 'manual' all is fine, can open to 100%. - External humidity warning came on repeatedly for no reason. under construction?? it says "control could not be loaded"
- several isolated wrong temperature measures, see end of log.